Testimonial: You Too Can Save $1 Million Buying a Home With Us! Disclaimer: Do not believe the post title, it is a hyper exaggeration. Your results may come in under $1,000,000 in savings. But why save Trillions, when you can save Billions? Ok maybe a bit much, but quote is the cliff notes: “FranklyRealty.com got me more money than I ever would have imagined.” Why exaggerate when you got that? With all those compelling options buyers and sellers have today, I think I need to go into more detail explaining exactly how a great agent can help you NET more and more importantly win a home when inventory is tight. But then he got educated. Read almost every blog post in this Blog and became a convert (ie. even smarter than smart). He took the leap and used Frankly Real Estate and is here to share his experience with others considering FSBO, Rebating or your mom’s friendly Realtor (which is an upcoming post, so make sure to subscribe!). Don’t get me wrong, I am not knocking going solo via FSBO (see best post ever on “saving” $20,000 via FSBO) or Rebaters. Heck, my long standing moto has been “I used to rebate, but then I got good”. P.S. What do you all think about an informal (rsvp required) home buying seminar for repeat or 1st time home buyers in the $500-$1.3M range (too many seminars out there for the $100-$300k range buyer). I thought the concept was cheesy, but was like “actually it could be pretty cool.” You in? p.s.s. Did you see my tweet on how my HGTV stars/clients are selling their Arlington home 3 years later? Here is the listing: AR7949281 it looks amazing. Frank, has anyone ever told you that you look like an older Daniel Larusso? I mean, you probably looked like an older version of him at age 20 b/c RALPH MACCHIO DOES NOT AGE. Thanks to Cody and you for helping to educate consumers out there that we Realtors are not all alike. It’s crazy how much people will research a $40K car before they buy it, but do little research on which Realtor they end up using to buy or sell….which could result in a $40K+ difference. Hey, a free car, just for choosing the right Realtor! Cody did recommend me to his neighbor who had his property under contract the year before for almost $100k LESS than what I was able to sell it for. Thanks for the recommendation Cody!! He totally does look like an older Daniel Larusso. I was wondering if you would recommend that Maryland attorneys buy homes in Maryland without a buyers agent (representing themselves as licensed agents), to receive a 3% reduction on the house, or would it be more worthwhile to pay for a buyers agent to negotiate a price, when purchasing houses in the 1.5-2M range? I understand this would require more work without a buyers agent, and does not appear to be as worthwhile when selling a house, but I was interested in the buyer’s perspective. Sorry I missed this comment. It was a good one, wish you would have emailed me directly. My fault. 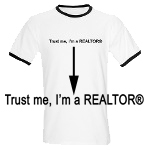 I am a lawyer (in NJ) and I am an agent and a broker… and I found a home… and I STILL hired a buyer’s agent!